Based in Idaho, the Sunshine Mint has been in business for more than 30 years, producing a great range of high-quality bullion, including pure silver and fine gold bars. They produce some patriotic pieces, some with unique designs, but they are not really known for their rarity, nor are they particularly prolific. Still, if you value quality and coins and bars that represent US history, this is a good place to look. The Sunshine Mint first opened in Coeur d’Alene in 1979. They have always been respected for the quality and the purity of their product, which earned great popularity in the early years. Thirty years later, the Sunshine Mint created new facilities in Las Vegas and Shanghai, China. These two cities love their gold and bullion, so they’re excellent markets, and it shows how far the Sunshine Mint has come, with their products valued by investors all over the world. One of the most popular products released by the Sunshine Mint is a simple silver round, sold for close to spot price. This was available in 1 ounce sizes for much of their history, but they have also recently introduced a half-ounce silver round. Another recent addition is the Gairsoppa silver bar, also available as a round. All of the silver used to mint this unique series was recovered from the wreck of the SS Gairsoppa, a British transport ship that was carrying a large cargo of silver from India to London during the Second World War. Sunk by German bombers as it tried to change course in order to re-fuel, the silver was not recovered until 70 years later. This story and the unique acquisition of the silver make this an incredibly special series that will likely carry a significant premium in years to come. The rounds don’t have the best design and it has been criticized for lacking detail, but you can’t argue with an origin story like that. Another popular and unique silver bar produced by the Sunshine Mint is the 1 Ounce Sunshine American Flag. This bar comes in the shape of a US flag blowing in the wind. Its unique shape and black and white representation of the Stars and Stripes has proven very popular in the USA and abroad. The Sunshine Mint also produces basic bullion bars in gold and silver. They come with mint marks and certificates of authenticity, and are appreciated for the quality of their packaging, much like PAMP. One of their most expensive bullion products is the 100 ounce silver bar. 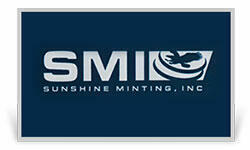 Sunshine Mint products carry either the name of the mint in full, or the “SMI” logo. This can often be found on the actual coin or bar but, on heavily-packaged pieces, it is placed on the packaging itself. Sunshine Mint also displays an eagle design on all rounds, coins and bars, regardless of size. The 100 ounce silver bar has eagle designs all over the back of the product. There is also a decoder lens on many Sunshine Mint products, although this is not the case with special edition products, including the SS Gairsoppa. This feature allows you to validate the coin, round or bar instantly. The packaging is also a good way to verify whether what you hold was minted by the Sunshine Mint or not. They are very unique in this aspect and go to a lot of trouble to protect the product and make sure it looks great. Rounds and coins will come in batches of 20, packed in a protective tube. They are sealed at the mint itself and, in most cases, the dealer will pass the product on, as is. This makes buying batches of 20 coins straightforward, as you know that those coins came directly from the mint, with little or no exposure to human contact or anything else.